Shadow home secretary Chris Grayling has accused ministers of trying to "deliberately deceive" people about immigration policy. He accused them of breaking Freedom of Information laws and trying to cover up a policy of increasing immigration. His claim relates to notes between officials and ministers released more than four years after an FOI request. Minister Phil Woolas denied that laws had been broken and said the details had been published months ago. 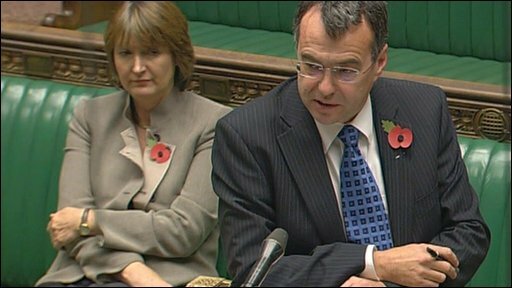 Mr Woolas told MPs the notes and e-mails related to a policy to clear a backlog of immigration cases between 2002 and 2004 - into which there had been a full inquiry at the time. Whistleblower Steve Moxon prompted the row in 2004; it resulted in the resignation of then immigration minister Beverley Hughes. He then requested details of documents in January 2005. Mr Woolas said that, under FOI law, ministers were allowed to withhold some details if there was a risk publishing them might prejudice the "free and frank exchange of views" between ministers and officials. Mr Moxon appealed and the case went to the Information Commissioner who, in March 2009, ruled more details should be released. "We then released that information in April 2009," Mr Woolas said. But Mr Grayling said: "More and more evidence is now emerging to suggest that this government broke Freedom of Information laws and tried to cover up a deliberate change of policy designed to encourage much higher levels of immigration, very probably for party political purposes." He said the documents showed that in 2002 rules were relaxed to clear immigration applicants waiting for more than 12 months "without any further investigation into their cases". The then head of Immigration and Nationality had e-mailed a minister to confirm the policy of "pragmatic grants", which meant "some risks would have to be taken", Mr Grayling said. Explaining his accusation of a cover-up, he said some copies of documents outlining the policy change were "clearly marked 'withhold' at the top". "Will he tell the House why ministers did break those [FOI] laws, laws this government itself passed?" asked Mr Grayling. "This is a government that has set out to deliberately deceive the British people and a government that has proved utterly incapable of telling them the truth about its policies on accusation." Mr Woolas told MPs the accusation that the government had broken the law was one "I absolutely reject". He said the policies in question had been the subject of a "thorough" investigation at the time and he dismissed Mr Grayling's attack as "his latest political gimmick". He added: "The allegation has been made, very seriously, that we broke the law - that was the phrase you used. "In fact, the ruling from the Information Commissioner was issued on March 5 2009 and on April 9 we disclosed, in line with that ruling, the information." The Sunday Times reported that the government had published the released documents on an "obscure" part of the Home Office website. It said the documents released showed ministers knew immigration staff were being asked to take risks when granting visas, work permits and leave to stay. For the Lib Dems, Chris Huhne said public confidence in immigration policy would only be sustained if controls were effective. "There is clear evidence here that immigration policy was to grant applications rather than refuse them, a policy that was never made public or debated in this House, giving the benefit of doubt to the applicant," he said. He added that exit checks should have been reinstated to show whether people issued short-term visas were leaving the UK.